So why is it that some coaches, speakers and trainers easily get paying clients, fill their events and sell a ton of their products and services and some who may even be smarter than them are really struggling to make their mark? I have been in this game for a short while. From working really hard with very little to show to being in a place where I find it relatively easy to sell my coaching solutions to clients without ever doing a hard sell. What Did I Discover That Turned Things Around For Me? I discovered that the secret to getting people to action. The secret to getting people to the point that they would trust me enough to invest their hard earned money on something I recommend and become paying clients is belief. If they believe they will buy. If there are doubts, they will hesitate. I have discovered 4 core beliefs that need to happen before they buy from you and I have decided to share them with you today. 1. Belief in Their Dream/Aspiration. We all have dreams, however due to lots of failures and disappointments and many well meaning people telling them to be realistic, most people have lost sight of their dreams – many have accepted they’ll never lose weight and fit back into that old size 8 dress, quit their job and start a successful business or have a blissful, fun filled relationship. They have accepted their lot, lost sight of their dreams and accepted their current circumstance as their permanent reality. Your first job is to get them dreaming again. You need to help them see the new reality against their current reality. Tell stories and paint pictures that help them reconnect with their dreams. Until their current reality is disrupted and their dream re-presented as an alternative reality, there will be no desire to invest in whatever your solution is. You need to get them dreaming again and believing that their dream is possible. Oh yes, this is a big one. According to research, most people never achieve anything close to their potential because they never put themselves forward and that’s because they don’t believe they’re good enough. Think about it. Have you ever been in a group and a call was made for someone to come and demonstrate something? Try to remember an instance where you put yourself forward and an instance when you didn’t but also were prayerfully hoping you weren’t picked. What was the difference in both scenarios? In the first instance you believed you could but in the second you had doubts and so you hesitated. It’s the same with potential buyers. You need to present your offers and communicate things in a way that they will be saying to themselves “I can do this”. And though that may be true sometimes, but most time it’s simply because we haven’t connected to them at their level and lifted them up to the new level but simply communicated from our level, impressed them with our knowledge and expertise and they’re now sitting there thinking “wow, she’s brilliant” or “oh my goodness, if only I could do what he’s saying”. Yes, you have impressed them but they still have doubts. You may be their hero, but they won’t become paying clients because they don’t believe they can do what you are saying. A key thing to remember when you’re demonstrating your brilliance and expertise is that ultimately it’s not about you but about them, their worries, their concerns as well as their dreams and aspirations. So in all you do in engaging with your community make sure you are helping them believe in themselves and their dreams. 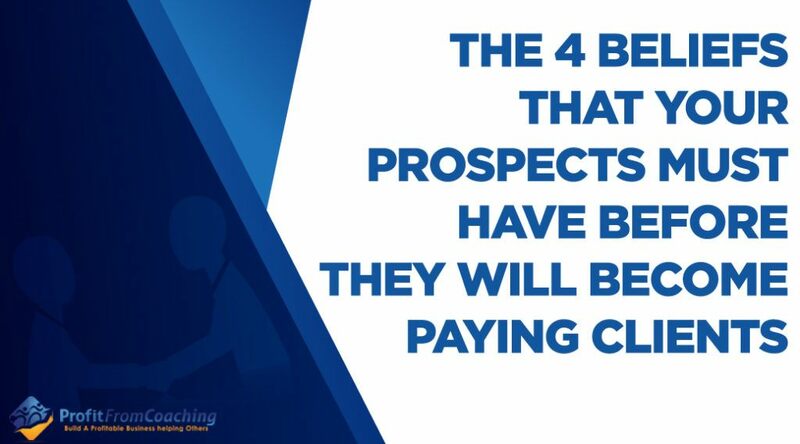 To Get The Remaining Two Beliefs That will Help You Convert Your Prospects Into Paying Clients, Be Sure to Watch The Video Below.